On our recent trip to India Amma made this chutney and I instantly fell in love with it. As many of my readers know I am a big fan of cilantro OR do I need to say it at all??? The mention of cilantro as the main ingredient initiated my enthusiasm in asking for the recipe. 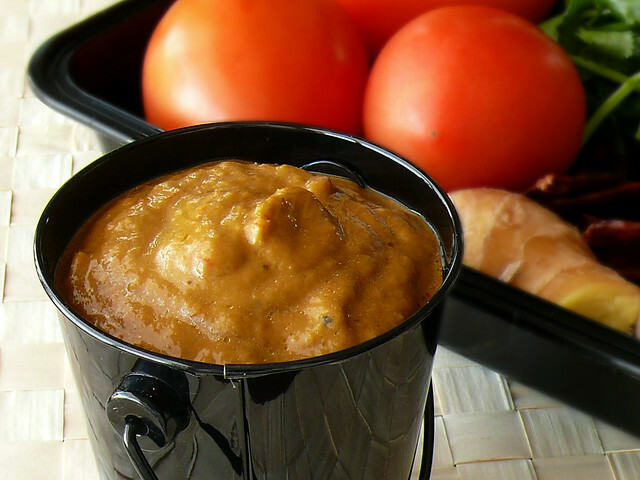 As I have mentioned before I have always tried looking for different chutney recipes and this particular one had all the best ingredients I would look for in a chutney. With all the goodness of cilantro, ripe red tomatoes and tamarind add extra zest to this easy and delicious dish . I have made this several times afterwards and my husband loves it too. Stays well for two to three days in the refrigerator. Heat a 2 teaspoon oil in a pan/kadai. Add mustard and fenugreek and when it splutters, add the asafoetida and transfer to a bowl. In the same pan heat up the remaining oil and add the red chillies and immediately add the tomatoes and ginger garlic paste( do not burn the chillies ). Sauté well for few minutes. When the tomatoes turn soft add the tamarind and chopped cilantro. Mix well for few more minutes until it reaches a thick gravy consistency. Remove from heat and let it cool. When cool grind to a smooth paste in a mixer. Transfer to the bowl and mix well with the seasoning and serve. TIPS: Goes well with idli, dosai, upma & pongal OR spread it on bread or chappati. I like my chutney spicy, if you like yours milder then reduce the red chilli count. I too am a cilantro fan.this chutney combo is very delicious and lovely. Love that cute bucket, one of my fav chutney, i love this combo anytime. Cute little bucket... chutney looks delicious. Lovely recipe in tat cute bucket :) Bookmarked ! mouth watering presentation, love the combo. 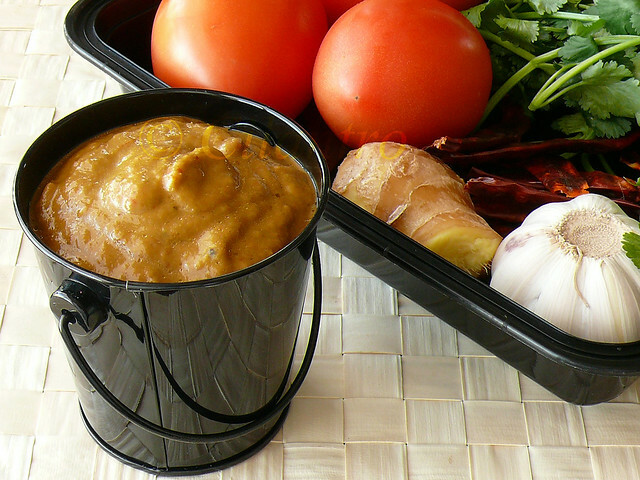 Chutney is mouthwatering, and more so because of that lovely black container! This is my favourite chutney.I love it with dosa and idly its heavenly when its made spicier.